If you are using the Windows 8 OS, then you are aware with this fact that to shutdown windows 8 or restart is not so easy, to do this you have to go Windows Charms bar after that you can find power option on Windows 8. Such a long process to shutdown and restart windows PC, in previous version of Windows OS you can find the Shutdown and restart button on the Start menu of windows OS. But Windows 8 has no Start button, so you can’t find any power option on the desktop. If you have read some of my previous tutorials, you will know that how you can make your own Windows 8 start menu or add start menu on your Windows 8 PC and use the power option from your desktop. But today in this post we let you know how you can Shutdown, Restart, Lock & Sleep Windows 8 from right click context menu. The trick is pretty neat and simple and need one or two click to setup the power options on your Windows Right click menu. Thanks to XDA forum member who come with the new hack which allows you to add power option on your Windows 8 right click menu. Follow the step one by one to complete this trick on your Windows 8 PC. Step 1. Download the three reg files available at the end of this post on your windows 8 Desktop and extract them on your desktop to get started. Step 3. If you want to add more power option on your right context menu like Sleep, Hibernate, Lock, log off, Switch user etc. Open the Turn Off Flyout folder from your desktop and run the Add Turn Off Options.REG file once and click Yes to confirm changes to the Registry. On the same folder you can find one more reg file Remove Turn Off Options.REG, with this file you can remove the Turn Off options from the right context menu. Step 4. From the last and third folder Teh file remover you can remove the Shutdown and restart power option from the right context menu, that you installed on Step 2. 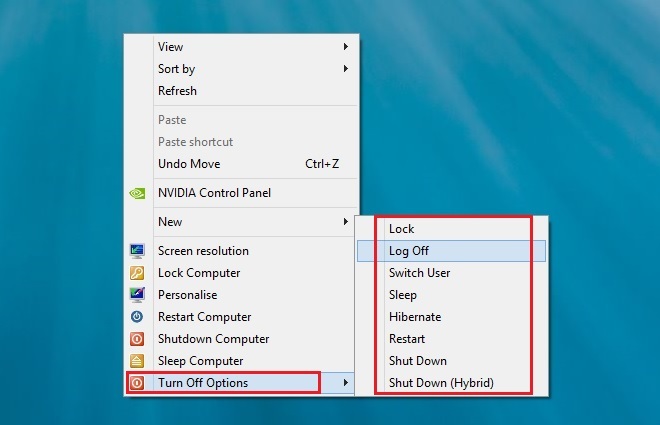 That’s it, now you can easily shutdown, restart, log off your windows 8 PC from your right click context menu. We tested all these files on our windows 8 desktop and all of them works fine without any problem. Looking for more Windows 8 tips and guide, click here! One additional entry I’d like to see is a “Power Options” menu item.